For the United States Cavalry tradition, see Order of the Spur. For the Knight of the Golden Spur (Holy Roman Empire), see Knight of the Golden Spur (HRE). For the Hungarian knights of Golden Spur, see Knight of the Golden Spur (Hungary). The Order of the Golden Spur (Italian: Ordine dello Speron d'Oro, French: Ordre de l'Éperon d'or), officially known also as the Order of the Golden Militia (Latin: Ordo Militia Aurata, Italian: Milizia Aurata), is a Papal Order of Knighthood conferred upon those who have rendered distinguished service in propagating the Catholic faith, or who have contributed to the glory of the Church, either by feat of arms, by writings, or by other illustrious acts. 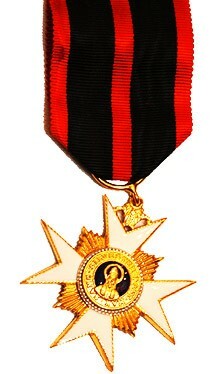 Badge of the Order. Scan from the Book of Orders at the Archdiocesan Library Cologne. It is accounted the earliest papal chivalric institution. The Order of the Golden Spur had its origins in the title Count palatine of the Lateran Palace, which was in the gift of the Holy Roman Emperor in the fourteenth century: Charles IV, Holy Roman Emperor conferred the title on one Fenzio di Albertino di Prato, 15 August 1357, at Prague. The Order began to be associated with the inheritable patent of nobility in the form of count palatinate during the Renaissance; Emperor Frederick III named Baldo Bartolini, professor of civil law at the University of Perugia, a count palatinate in 1469, entitled in turn to confer university degrees. "Bartolini also received the Knighthood of the Golden Spur, a title that sometimes accompanied the office of count palatinate in the Renaissance", according to the historian of universities Paul F. Grendler; the Order of the Golden Spur, linked with the title of count palatinate, was widely conferred after the Sack of Rome, 1527, by Charles V, Holy Roman Emperor; the text of surviving diplomas conferred hereditary nobility to the recipients. Among the recipients was Titian (1533), who had painted an equestrian portrait of Charles. Close on the heels of the Emperor's death in 1558, its refounding in Papal hands is attributed to Pope Pius IV in 1559. By the mid-18th century the Order was being so indiscriminately bestowed that Casanova remarked "The Order they call the Golden Spur was so disparaged that people irritated me greatly when they asked me the details of my cross;" he had the grace to add that he would have been pleased if he had been able to answer "mon Toison", and he did habitually wear it, nevertheless, on its scarlet riband. In 1777 Wolfgang Amadeus Mozart had his portrait painted with the star-encircled cross of the order on his coat, and the Order granted to Giovanni Battista Piranesi permitted him to sign his etchings Cav. G.B. Piranesi. The Order was granted to "those in the pontifical government, artists, and others, whom the pope should think deserving of reward. It is likewise given to strangers, no other condition being required, but that of professing the catholic religion." In the 19th century, members of the Curia, prelates and papal nuncios had the privilege of nominating recipients. The Order was given out liberally upon payment of a small fee, some scandal arose in Paris concerning the sale of forged letters patent claiming to confer this title, formerly linked with the purely honorary designation Count Palatine of the Sacred Palace of the Lateran, Honoré Daumier include the "Knight of the Golden Spur" among his series of lithographs "Bohemians of Paris" (1842); its satirically mocking legend reads "This so-called former Colonel of the Papal Guard, later aide-de-camp to the Prince of Monaco, awaiting as a prize for his services a distinguished post in the Government!... he would, however, willingly accept a tobacconist's shop or a position as an inspector of [street] sweeping; besides, he is a gallant man like all knights of his order, for a trifle demanding satisfaction from five-year-old children, perfectly making excuses from the moment you look at him in the face." The badge, as described by Robson in 1830, was an eight-pointed gold cross with a ray point between each arm and the legend BENE MER•ENTI. On the reverse was Ex dono with the name and date when presented. On top of the cross, an imperial crown, and at the base a small spur. 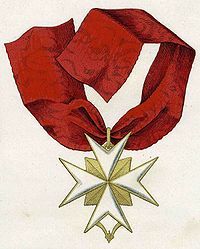 In 1841, Pope Gregory XVI, in the Papal Brief Quod Hominum Mentes, reformed and renamed the order as the Order of Saint Sylvester and the Golden Militia. He withdrew all faculties to whom and by whomsoever given, and forbade the use of the title or the decoration to all knights created by any means other than a Papal Brief. To restore the Order to its ancient glory, he limited the number of Commanders to 150 and knights to 300 (for the Papal States only), and appointed the Cardinal of Apostolic Briefs as Chancellor of the Order, with the duty of preserving the name, grade, number and date of admission of each knight. On 7 February 1905, in commemoration of the golden jubilee of the dogmatic definition of the Immaculate Conception, Pope Pius X in his motu proprio Multum ad excitandos, divided the order into two, one taking the name of Order of St. Sylvester and the other taking the older name of the Order of the Golden Spur, and placed it under the patronage of the Blessed Virgin Mary. In modern times the order has only one class, Knight, and its membership has been restricted to one hundred knights throughout the world. The honour is conferred by a Motu Proprio of the Pope. It is used to award merit, without any consideration of noble birth, and no longer confers nobility, as it did before 1841. It is the second highest of the papal orders (the first being the Supreme Order of Christ). The badge, an eight-pointed, enamelled gold cross, in whose center is a small white medallion on one side of which is the word "Maria" surrounded by a golden circle, and on the other the year MDCCCCV and in its surrounding circle the words "Pius X Restituit". Pendant from the bottom of the cross is a small golden spur. The decoration is suspended from a red ribbon with white borders. The star, which is worn on the left breast, is the same cross centered upon the rays of a silver star. 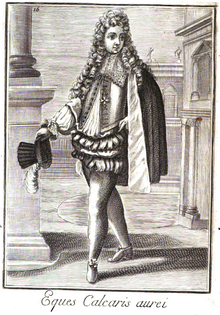 The official uniform is a red tunic decorated with two rows of gilt buttons, black velvet collar and cuffs embroidered in gold, black trousers with gold side stripes, epaulettes ornamented with gold fringes and surmounted on top with the emblem of the order, gold spurs, oblong two-peaked hat trimmed with gold and bearing the papal colors, and a sword whose hilt forms a gilt cross in a black scabbard, held in place with a gold sword belt with red fringe. 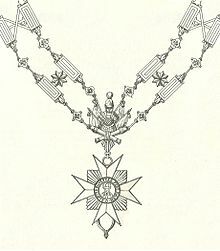 In the early days of the order its members were entitled to wear a gold livery collar (chain), but when the order was revived in 1905 this was not resumed, though the collar remains a symbol of the order. In ecclesiastical heraldry, individuals awarded this Order may depict the gold livery collar completely encircling the shield on their coat of arms. Heinrich von Olnhausen Conferred in 1388 at Jerusalem as knight of the holy crusade. ^ Heraldically gold, it is to be understood: "Throughout the Middle Ages gold was far too rare to permit spurs being made of solid gold, despite the importance with which spurs were regarded. They were usually made of iron, brass, or copper, silvered or gilded, and often of iron tinned". (Stephen V. Grancsay, "A Pair of Spurs Bearing the Bourbon Motto" The Metropolitan Museum of Art Bulletin 36.8 (August 1941:170–172) p. 171). ^ Grendler 2004:184 note 134. ^ "Scrutator" in Notes and Queries 3rd Series, 3, p. 254. ^ Robson 1830; the language used in the patent was French, the international diplomatic lingua franca of the era. ^ The bachelor Honoré V, Prince of Monaco, had died the previous year, during which the pope had included the Order within the Order of Saint Sylvester and the Golden Militia. ^ The National Museum of western Art: Daumier, "Bohemians of Paris", 24 (illustrated). ^ Catholic Encyclopedia, 1913, s.v. "Orlandus de Lassus". ^ Casanova, Histoire de ma vie, 7:ix, 8:ix. ^ Wolfgang Amadeus Mozart, Mozart's Letters, Mozart's Life: Selected Letters, transl. Robert Spaethling, (W. W. Norton & Company Inc., 2000), 17.